In this lab, we will incorporate error handling into the login process so that a notice of each invalid login is automatically e-mailed to the technical support staff. When you try to log in, if your user name is not Mickey, Minnie, or another user that you added (that is, if the user name is not found in tblUserLogin), then an e-mail should be sent to the address recipient@recipientdomain.com. If the user attempts to bypass the login page by typing a page name in the URL, your Web application should redirect the user back to the login page. Once you have verified that it works, save your project, zip up all files, and submit in the Dropbox. NOTE: E-mails may be blocked due to firewalls, antivirus software, or even Internet service providers that turned off SMTP because of some known security issues. If the code works (does not produce an error when submitting), you will get full credit for this project even if no e-mail message is actually transmitted. Consult with your instructor before submitting if an error occurs or if no e-mail is generated, to be sure. 2. Click the ASP.NET website named PayrollSystem to open it. 3. Create a new class called clsBusinessLayer. NOTE: Change the youremail@yourdomain.com and receiver@receiverdomain.com to your e-mail and someone else's e-mail for testing. 6. Optional: Perform this step only if you are doing this lab using Visual Studio installed on your own computer and you have administrative rights on your computer. 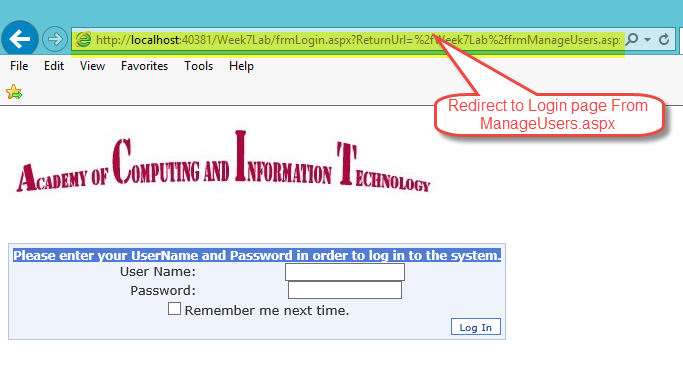 If you are doing this lab using the iLab (Citrix) server, or if you do not have access to IIS, skip to Step 8. 7. In previous versions of Windows, the SMTP server was built into IIS. Now we will need to get a separate one. On the Microsoft Codeplex site is an SMTP server called smtp4dev, specifically designed for development environments. 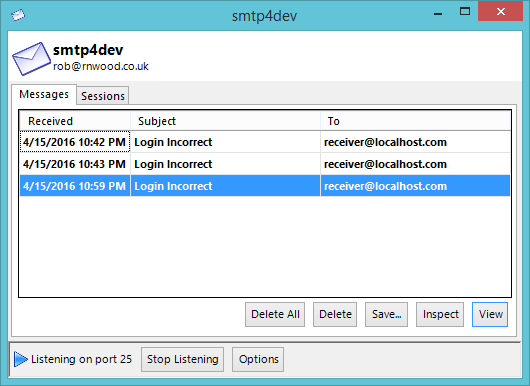 Pages 652–653 in the text discuss how to download and use smtp4dev. 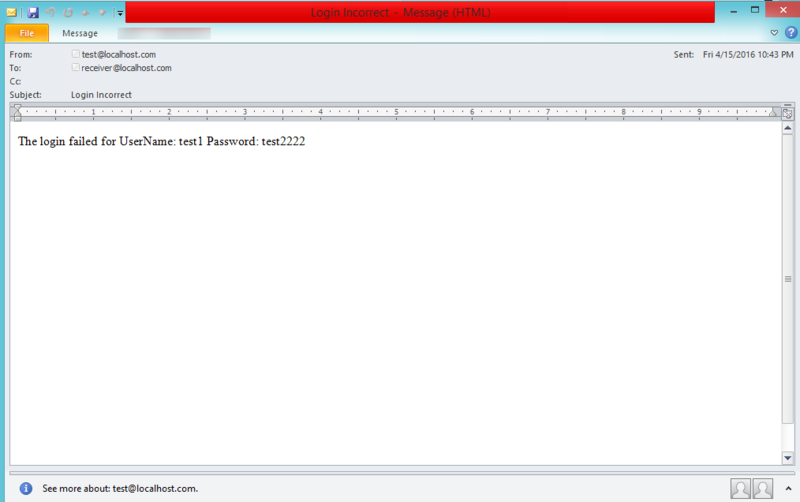 The site is http://smtp4dev.codeplex.com. Click on Downloads. Another example is Papercut, downloadable at: http://papercut.codeplex.com/ You can use either smtp server. Test the e-mail by logging in as someone other than Mickey or Minnie. You should receive an email to the SMTP client. 9. This still leaves the possibility of a person bypassing the login page. We will fix that by using forms authentication. Add the following to the web.config file before the tag. •	Make sure you reestablish your database connection if you copied the files from a previous lab. Also, make sure to update the web.config file with the database connection string. •	Update any DataSource controls that you added with the new payroll database location. •	When you manually try to go to a second page by skipping the login page, a cookie is set specifying the name of the page you were attempting to visit. Once you log in successfully, ASP.Net will automatically attempt to navigate back to that page. You can reset the cookie so that the next page is frmMain, as expected, by typing that page in the URL for the browser before logging in. Submit Final Lab (includes all previous lab assignments). 12. Run your project. When you try to log in, enter a username that is not Mickey or Minnie (i.e., a username that is not found in tblUserLogin). An e-mail should be sent to the recipient@recipientdomain.com e-mail address. 13. Test that frmMain reconfigures properly based on user role. Make sure that the user cannot bypass the login page. Once you have verified that everything works, save your website, zip up all files, and submit them in the Dropbox. NOTE: E-mails may be blocked due to firewalls, antivirus software, or even Internet service providers that turned SMTP off because of some known security issues. If the code works (does not produce an error when submitting), you will get full credit for this project even if no e-mail message is actually transmitted. Consult with your instructor before submitting if an error occurs or if no e-mail is generated. It is expected that no e-mail will be sent if you are using the DeVry iLab (Citrix) server for this lab or if you were not able to download and install smtp4dev. NOTE: Make sure that you include comments in the code provided where specified (where the ” // Add your comments here” is mentioned), including code you wrote, or else a 5-point deduction per item (form, class, function) will be made.